The meaning we give to certain situations can either make us or break us. Here is another one of my personal stories when I started to work at Magna. Like so many other Canadian immigrants, I faced the challenge of being a second language speaker. To be honest, my English was o.k. but it was quite challenging at the beginning to “fit in”. I had to file, copy and organize training binders, and I took every seemingly insignificant task with a smile and treated it as the most important learning opportunity. There were 2 ladies in my office who tended to make fun about my accent. They laughed about my pronunciation and they made me repeat certain words several times just to make fun of me. While I found this quite hurtful at the time, I made the conscious decision that I wouldn’t allow them and their sense of humour define my ability about what I can and what I can’t do. What is funny to one person, may be hurtful to another. Learning to laugh at yourself is important if you want to live a happy life. The magic is in your own mental attitude – love life and it will love you back. Most people have absolutely no clue how their actions affect others. Difficult situations can be the stepping stone to improve your skills – I joined Toastmasters, became best friends with the online dictionary and I signed up for speech competitions to improve my communication skills and my self-confidence. The people who make fun about you, may have fewer skills than you (these 2 ladies spoke only English). Nobody defines who you are except yourself. Someone who wrongs you can be your best teacher if you recognize it. I have learned so much during my Magna days and I will be forever grateful for all the lessons, which helped me to become a better (and a smarter) person along the way. 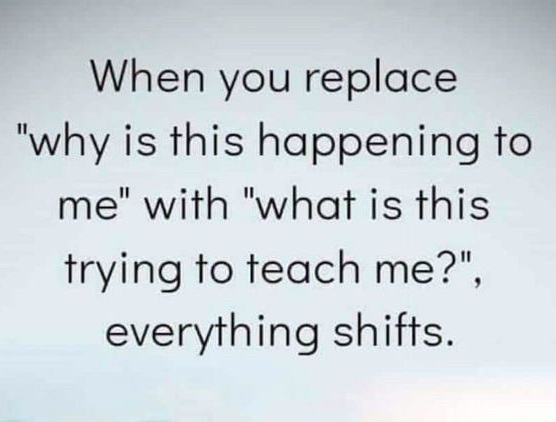 “What is this trying to teach me?” is one of the best questions you can ask yourself. Go for it and reflect! That’s how shift happens.